SES-15 is another step closer to its Thursday liftoff as this telecommunications satellite has now been positioned atop Arianespace's Soyuz launcher in French Guiana. After its transfer to the launch zone, the “upper composite” – which includes the SES-15 satellite passenger, Fregat upper stage and protective payload fairing – was hoisted inside the mobile gantry, then integrated with Soyuz to complete the launcher’s build-up. Integration occurred this week during activity at the Spaceport, in which the basic three-stage Russian-built Soyuz vehicle was rolled out from its MIK integration building and erected on the launch pad. This was followed by transfer of the mission’s “upper composite” – consisting of SES-15, the Fregat upper stage and payload fairing – for integration atop Soyuz, which is enclosed inside a protective mobile gantry. With Soyuz completed, all is now ready for the final checkout and tomorrow’s Launch Readiness Review – which will clear the way for a May 18 morning departure of the medium-lift mission, designated Flight VS17 in Arianespace’s launcher family numbering system. Flight VS17 will be the second-ever launch to geostationary transfer orbit performed by Soyuz from Europe’s Spaceport in French Guiana. The first was conducted earlier this year, successfully deploying Hispasat 36W-1 on January 27. 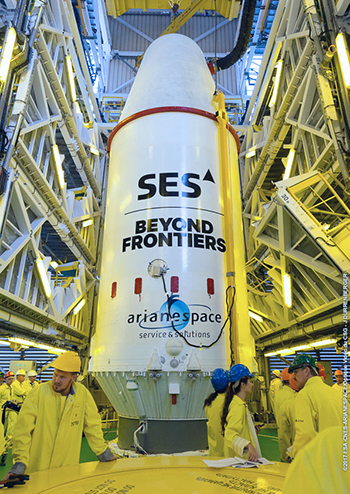 SES-15, produced by Boeing using the all‐electric 702SP platform, will be the 40th spacecraft orbited by Arianespace for long-time customer SES. It is to be operated from an orbital position of 129 deg. West, with the satellite offering extensive coverage over North America, Mexico and Central America – stretching from Arctic Alaska to the South of Panama, and from Hawaii to the Caribbean. The spacecraft has an estimated liftoff mass of 2,302 kg., with the workhorse Soyuz launcher’s total lift performance set at 2,447 kg. – factoring in the payload integration equipment and other hardware. 08:54:53 a.m. 11:54:53 a.m. 07:54:53 a.m. 01:54:53 p.m.